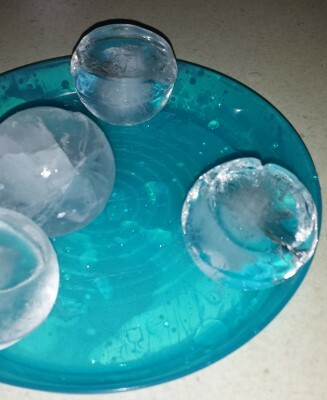 When I was little, my Grandma had this wonderful ice block which would create round ice cubes. I loved that thing. There is something about an ice sphere that is so pleasing to me. 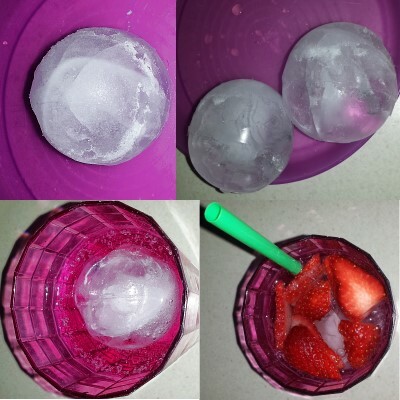 So when we saw some wacky sphere ice cube moulds at Kmart for $2.00 we thought we would pick them up and give them a try. It was a trip down memory lane for me, somewhat. To begin with they were quite successful, though, over-filling them did create an Icicle Incident in the freezer. 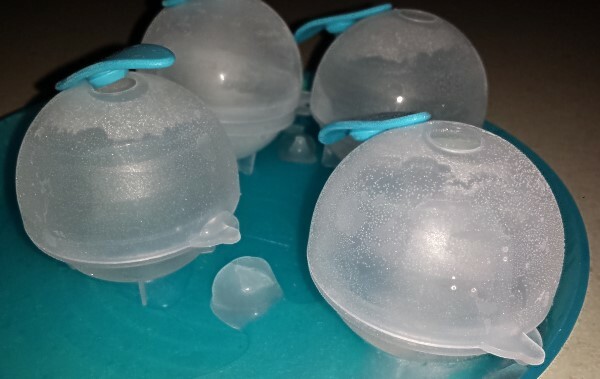 However as time went on, they developed leaks where you open the spheres to let the ice out, and generally caused a mess and became a bit of an epic fail. 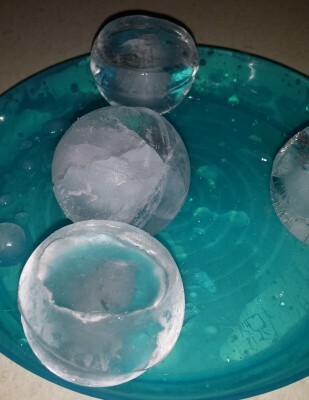 Instead of spheres, you got half a sphere and then a space with no ice because that water had leaked out onto the plate I kept them on. I could probably have filled them a second time once they had frozen enough to seal, but it was a little too much hassle and annoyance rather than fun. We’ve stopped using them now because of this epic failure. I’ll keep looking for something more like this and hopefully one day I might find one that makes the mini ice balls like my Grandma used to make. Grandmas was more like this but it had 3 lines of ice spheres. I already have an ice cube tray which makes those large square ice cubes and for the time being I will enjoy those. 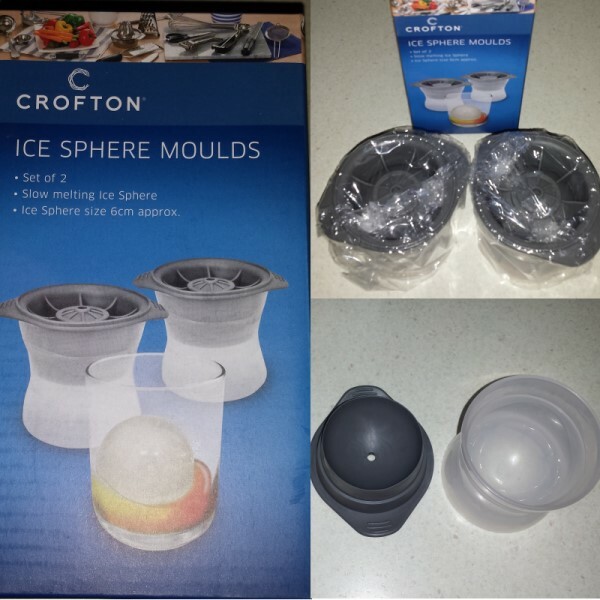 At the end of August, during our fortnightly Aldi shop, we spotted these ice sphere moulds. 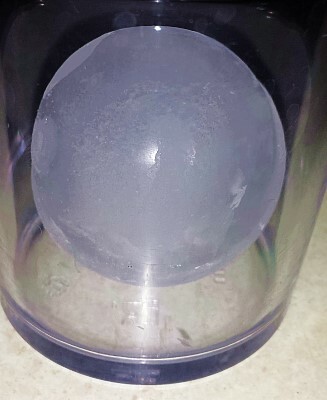 This mould makes large ice spheres very successfully. If they have some more of these on our next visit, I intend to pick up a couple more. Do you like a wacky ice cube? :) Do you have any ice cube memories? When I was little, my family owned a chain of electronic stores. At the main office, which was in a little cluster of shops, two shops down there was a little “deli” in the old style of delis, run by a Greek family who we were friends with.. 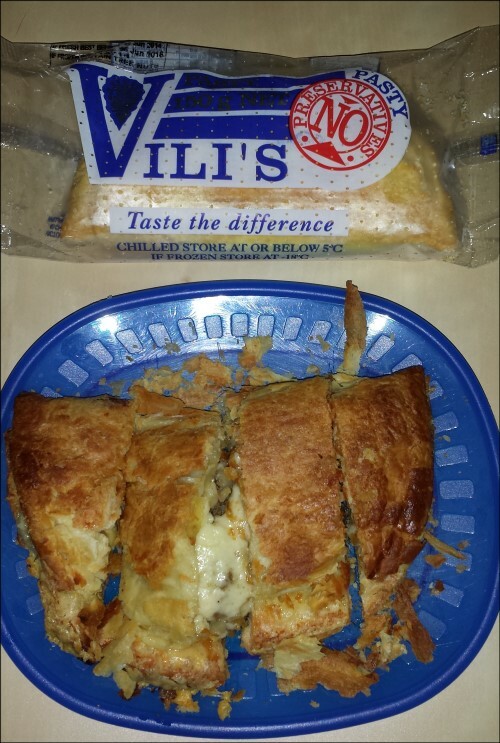 They would take a Vili’s pasty, slice it open, put cheese in there, and then put it back in the oven for the cheese to melt. We can get Vili’s here now and when we buy it, we do not mess about. We buy 2 boxes of pasties at a time, 24 pasties in total. They are frozen when we get them and these go into the freezer for later consumption. I can’t eat them without cheese. I’ve put all kinds of cheese inside there – mozzarella, parmesan, American jack cheddar from Costco, vintage cheese slices, feta, it doesn’t matter what kind of cheese – though the feta was super tangy and took the taste experience up several notches – the Vili’s pasty is king of all pasties. I hate to break it to you, Adelaidians reading this, but in Sydney they put *peas* and *corn* into pasties. What kind of wickety wack idea is that shiznit? It is wrong on so many levels! When I was 9 years old, I was very excited about the next school year. Two weeks before school starts they would put up the lists of which kid was in which class. There was a teacher who I adored and I had been assigned to his class. For the next two weeks, I was floating in a happy daydream of the school year ahead of me. On the first day of (Grade) Year 5, I was nervous and excited and I had butterflies. These had settled down somewhat by 10:30am, which was recess time. I happily headed out to play, not knowing what unpleasantness was looming like gathering storm clouds. When I returned to the classroom, the headmaster was in our room and he said “I need these 5 students to follow me to my office”. My name was one of the 5. Not knowing what was going on, I was very surprised to find my Mother waiting in the office, with 4 other parents. We were told as a group that the Sunney Twins had enrolled late – on the first day of school, and this meant they had to do some shuffling of classes. The five of us were considered the most “brainy” in the class, so they wanted to bump us up to make a Year 5/6 class. The tears began not long after this – for all five of us. None of us wanted to change classes but our parents were then told – in front of us – that if we refused to change classes we would be expelled from the school as they would be unable to fit us in as students. Even worse, we would be made to do homework – Year 5 was the last year of freedom in this country back then, Year 6 was when they started sending work home after school. This made me fall to a crying lump on the floor and not long after that I was utterly hysterical. The headmaster was not impressed or sympathetic, and he said we had to go to our new classroom now. The parents told him to wait until the kids had time to get used to the idea, or even let them take us home and start fresh tomorrow but he was stony faced and said no. All five of us were still in tears. I do not recall anything about leaving the office but I do remember right in front of my new classroom there was a fence. When I got near it, I grabbed on to it for dear life and refused to move any further, crying, screaming. When the headmaster came over to dislodge me from the fence, I kicked him square in the face. Yes, you read it right, ladies and gentlemen. I kicked the headmaster in front of all my new classmates. This I did not live down. The girls in the new class were pure evil. Beeyotches of the highest order. I hated all of them – and they hated me equally as much. I only had one friend in that class, my Chinese best friend Ellen. We tolerated the other three only because we were forced to stick together – they were boys and therefore not the kind of people we hung around with. Everyone else was an enemy. Even the kids I used to be friends with became distant – we tried to play with them at recess and lunchtime but they were talking about things that happened in their class and we were not included in that – we had not been there. The frames of reference were completely different. Homework was an enemy too. I refused to do it at all. When the teacher gave me homework assignments, I would scribble all over the page as soon as she gave it to me, grade it myself with a fail mark and hand it back to her with a smirk. Mother was called in many times to discuss this, and she was enlisted in the war to make me do homework – so she soon became an enemy as well. I felt she should have told them I wasn’t going to do it and they should not expect any of us year 5’s to do it when nobody else in the other Year 5 class had to do it. I remember many nights where she made me sit in my room until I finished my homework. I never did any of it. Not once. I would just sit there and scribble holes into the page. I was so angry. With her, with the school, with the beeyotches, with the inferior teacher I hated, with everything. I believe now this is the point at which I just gave up on caring about success or good grades – I hated everything about school. The only thing I liked was reading and the minute my Mother would leave the room, I would open a book and escape. Mother said to me years later that she felt she should have taken me out of that school that day – I wish she had – but she didn’t know what was the right thing to do. The results caused long lasting effects in my school life, my relationship with her as a parent and my personal life. My grades went downhill and never recovered. I became angry with being smart, and decided I would simply refuse to be smart. I ignored maths completely because that was supposed to be a smart subject – and four years later in Year 9 I failed maths because I never had that solid grounding in the subject. I was one of the brightest kids in that school but I decided to become unbright. You know what they say about use it or lose it? I lost a lot of my skills in various areas. Art was another one. Sport was when the year 6 kids got to push us around and beat us up without getting into trouble and they took great delight in it so I found excuses not to play. I began to put on weight as a result of this – and the long nights spent refusing to do homework when I should have been out playing with all the other kids my age. The next year, I thought we would be placed back in our normal years – but no. They put us in a split 7/6 class – the five of us who clung together like rats on a sinking ship, and the same people I’d hated for the last year. This caused already shaky friendships to become non-existant with the students of our year level – so the following year when we were all in the same class, the five of us were outcasts, ignored, and teased. This post has been a Hump Day Hmmm post. Feel free to join in the Hump Day Hmmm anytime! Just in case something happens.. This post is sure to seem odd. I don’t usually post about my health and a vast array of other inappropriate subjects. For the last three weeks I have had some kind of evil flu which does not seem to go away. Whenever I get the flu I am reminded of the one time I got pneumonia in 2003 right before Christmas – summer, in Australia, hello? But I went to the dentist with wet hair, and my dentist was in Glenelg, and the day I went it seemed like there was a breeze right from the Arctic blowing up the middle of Jetty Rd. A few days later I could hardly breathe and I honestly thought I was going to die. Plus, back then I was a smoker and I couldn’t smoke, so not only did I feel terrible but I was the crankiest person anywhere ever. I remember begging the other half to get me Garlic Prawns from Marcellinas in the middle of the night – and so worried about me was he that he actually did it. I believe that was about 4am. Marcellinas was open till 5am.. ;) and the garlic prawns were spectacular. I could not sleep lying down. We had a waterbed (still do) and I could not sleep there – I felt like I was drowning whenever I lay down. I made a makeshift kind of bed on the sofa bed which involved a lot of pillows and spare matresses so I could be sitting up when I was lying down. Days disappeared while I hovered in some kind of delirious state. I remember nothing of it. When I did eventually wake up, I was craving a cigarette. I went out into the backyard and I tried to smoke, but I could not. That was when I gave up smoking for good. In the middle of the night last night I woke up and I thought – what if something happens to me? Will they know what to do with me when I am gone? I don’t want to be buried and decompose. I don’t think I would like that. On the other hand, I really don’t like the idea of cremation – what if I am actually still alive but in some kind of death like state? However all us ladies are prepared to sacrifice comfort for fashion and I am no exception to the rule. I would like to be cremated and turned into a diamond. Impossible, no? No, it is actually possible. It’s called Lifegem. And though I thought I must have mentioned this before a search of my blog shows that I have not. It amazes me because this is like fundamental to the core of me now, this is what I have decided I want done after a long struggle of not knowing what I want done, and I have not even mentioned it to you guys? Well, what I really wanted was to be cremated and put on the mantelpiece but the other half refuses. He thinks it would be spooky, and he says we don’t have a mantelpiece. He is right, we don’t. However, would it be so difficult to create one just for me? He also thinks I will live longer than he will. Over my dead body. I refuse to be the last one standing. Anyway, I’ve had a nasty flu, and I have said nothing about it because I don’t want to bore people with that shiznit and I wouldn’t have said anything but it explains why out of the middle of nowhere I am talking about what to do with my remains. So now you know, and there you go..
And Adelaide people, I miss Barnacle Bills. Seriously, you don’t know how good you have it. Go get a two in one snack pack and eat it for me, will you? Ah Adelaide, I knew you well..
I’ve been here over a year now. It seems like forever. But sometimes, memories of the city I used to call home come to me as a surprise. I actually spent a whole night dreaming of places in Adelaide. So for those of you who might live there and consider leaving there, here is your future in one simple blog post. Originally built to house the new Myer, and containing two outrageous floors of amusements on levels four and five in the part that was not Myer but was called “Dazzleland” including an indoor roller coaster, I did spend quite a lot of time in this building over the years. It’s a shame that they quickly shut Dazzleland down. I have fond memories of the roller coaster. Here is an ad about it! How lucky you are to have such a gorgeous place right in the middle of the city. Hidden in the middle of the Botanical Gardens there is a hothouse of such goodness, and it contains a pond which is teeming with tropical live-bearing fish. It is one of the most relaxing places on the planet, I think. How long is it since you were there, people reading this who live in Adelaide? What’s your excuse, huh? And I won’t even go into the goodness of the Zoo. Oddly, this is one thing I really truly miss. Leaf and Ladle, which makes great soup and salads in town. The Sushi Train. And some local places we used to go to and eat great food. Our names for them were not the same as the real names for them and I can’t remember the real names for them! But there was a great place on Grange Road near Tapleys Hill Road which make the best burgers. And there’s a great chicken place on Tapleys Hill Road which made the best roast chicken and chips. And Barnacle Bills. And Vilis Cafe. You don’t think it is any good? Move out of the state for a bit, you’ll think again. The trains run on time. The tram is brilliant. Even the buses were reasonable. The 99b, I miss that greatly. But I loved the trains, and the last two places we lived were very close to train stations, which I loved. I haven’t really had much of a chance to explore the city of Sydney. The main part of the town where I live is not very exciting really. But Adelaide city, there was always so much to see and do and places to go and even if you didnt have anything to do there was a lot of fun to be had watching other people. The shops were great. I miss the shops. However, there’s some things I don’t miss, like the slow driving everywhere, the 60km speed limits, and the beaches. Not when I have these new beaches here, and great snorkelling within a short drive from home. Yeah I know, I said I wouldn’t do it. But this one isn’t so much about politics as a fact of life. Kim Beazely is currently a shrinking man. According to a news article, he has lost 16kgs since the start of 2006. A lot of people seem to think losing weight will win him the next election. I have some bad news for those people..
Every week at the high school I went to, they had a speaker turn up and address the entire year. That was a fair bunch of people, as I’ve mentioned before, I went to a school with over 500 people in my year level alone. So these were held in the library with people squeezing into every space imaginable. One day in year 10, a speaker from Flinders University gave a lecture entitled “Why fat people are dirty people”. By that time, I was not really that fat anymore. I had been a size 16 when I started that school in year 8, and those uniforms were literally swimming on me by now, I couldn’t wear them anymore..
I’d got down to a size 12 and realistically I was no bigger than anyone else there in the room, but I was still one of the “fat kids” and when I saw eyes begin to turn in my direction as this cruel man went on and on about fat people being dirty, I knew it would not matter if I was just skin and bones, those kids would always see me as one of the fat kids. I mean, let us not even get into the fact that the school allowed this lecture to take place, because they should not have. That anyone should have been allowed to stand up there and say that to any group of kids is just wrong. It’s bad enough for a kid with a bit of extra weight in school. The teasing, the bullying, the nastiness, none of it is nice but it *is*. It exists. You can’t stop it. At least, not without automatic weapons, or bamboo canes applied to any kid saying something nasty, and that’s kind of taking it too far the other way. But after this lecture it got plenty worse, especially for the largest kid in the year, a boy named Andrew who despite his outer shell was an incredible artist. He did some amazing work but nobody ever saw that, and the treatment he got caused him to become an extremely angry individual. Any teasing directed his way would generally be met by swearing and then later, punching. He spent a lot of time in detention, with me and the deputy principal who died. I wish I could have called him my friend, but he was so busy building walls to stop people from getting close enough to him that they could hurt him, there was no chance of breaking through. And I understood that, because I’d had to do that myself at times. Fat kids know that the outer shell really isn’t that important, because we know on the inside there’s plenty we have to offer. But in an environment where everyone sees only the outer shell, and makes judgements based only on that, you are never given that opportunity. So when I left that school at the end of year 11, I was down to a size 10. I didn’t really like myself at that size at all. I’ll be honest with you. When I looked in the mirror all I saw was these enormous cheekbones that models would probably have killed for, but I did not like them. I thought I looked like a skeleton, and quite ill. But moving to a new school, things changed entirely for me. I was accepted into the “in crowd”, got the lead in the year 12 play, and I was driving by this time so I didn’t have my own car but I had pretty much the use of my parents car, and it was an adult campus so it had a much more mature attitude towards things. I did subjects I really enjoyed instead of what the school forced you into (photography, media studies, catering and cooking, drama, stuff like that) and it was a great year. None of those kids ever knew that at my old school I was considered one of the fat kids. But when the outer shell looked acceptable to them, I had a much better chance of them seeing what was on the inside, and that had not changed at all – I was still me. I was that same me at the previous school. It’s just nobody gave me a chance there. I hate to say it, but it’s the truth – Kim Beazely is going to find the Australian public just the same. He can lose all the weight he wants. He can be stick thin, but it will do him no good, and it will not win him any elections. He will *always* be the fat kid, except to those of us who were fat when we went to school, who can see the inner shell. And statistically there’s probably not that many of us out there – there will be more and more as the years go on, but most schools only had a few back when I went to school. So this does not bode too well for the ALP, because I don’t believe the Australian public will ever elect Kim Beazely, regardless of what weight he is. The damage is already done. I sincerely believe that supporters of the ALP have to realise they are never going to be elected with Kim Beazely at the helm. *and* I know it’s not fair, you know it’s not fair, but it *IS* – and that’s the bottom line. But..
Who do they have, who is stick thin? Who also knows plenty about the environment, a major concern for increasingly more Australians? Who may be bald, but the public don’t hold that against you like they hold once being overweight against you. Just for God’s sake, don’t let him dance..